Former Dallas Cowboys quarterback Tony Romo plays basketball at a Plano church with tight end Rico Gathers Monday night. Two Dallas Cowboys in the midst of changing sports played basketball at a Plano church Monday night. 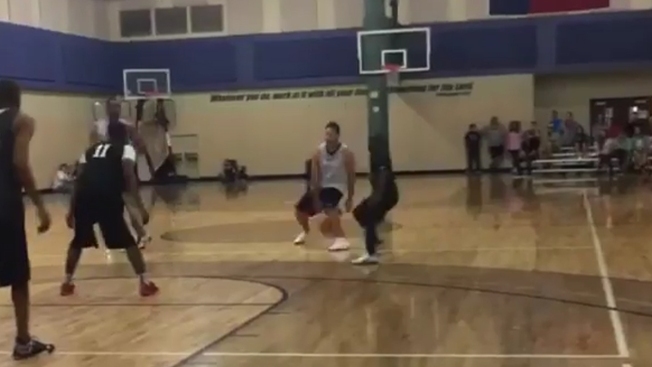 Cowboys tight end Rico Gathers posted videos on Instagram of him playing in a Prestonwood basketball league game along with Dallas Maverick — for one day — Tony Romo. The first video captures the former Cowboys quarterback with couple of crossovers and a nice pass — of course — to Gathers, who finishes for two points. The second video shows a thunderous dunk by Gathers, who played basketball at Baylor before signing with the Cowboys as an undrafted free agent in 2016. He credited Romo with the assist. Romo is likely tuning up ahead of his game as a member of the Dallas Mavericks. The team will honor Romo by making him a Maverick for a day, letting him suit up in his No. 9 and sit on the bench during the team's final home game Tuesday. Gathers spent the season on the Cowboys' practice squad after making the switch from basketball. Before joining the Cowboys, he hadn't played competitive football since middle school.